Queer Ugandan filmmaker Kamoga Hassan lives in fear for his life, but says he is determined to keep telling stories from one of the most dangerous countries in the world for people who are part of the lesbian, gay, bi-sexual, transgender and queer (LGBTQ) community. 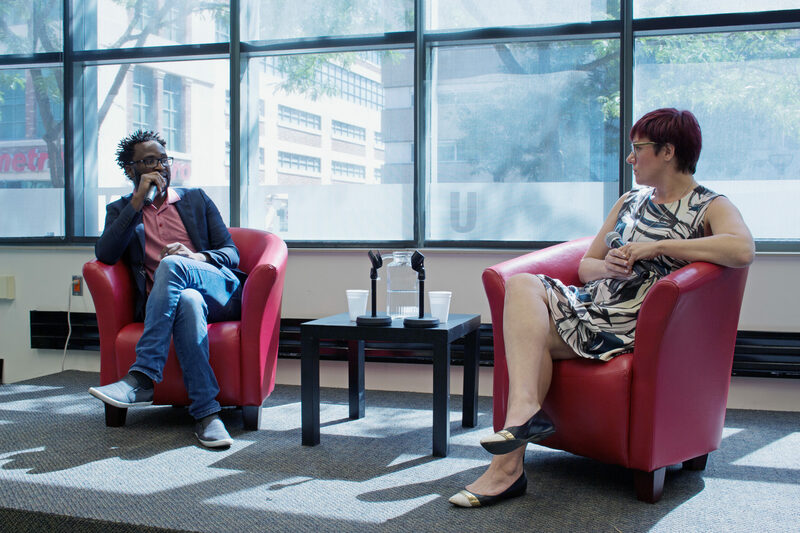 Hassan spoke with Andrea Houston, a freelance journalist and instructor for the Ryerson School of Journalism’s Queer Media course, following a Sept. 20 screening of his 2014 film Outed: The Painful Reality. The movie is a drama based on the true story of what happened after a Ugandan newspaper printed an article that outed the “top 200 homosexuals” in the country. The article listed photos, names and phone numbers and resulted in the arrest, exile and in some cases murder of many of those who were named. His feature film recounts the true story of how one of the men identified in the newspaper story was tortured by police and killed by a mob. Hassan said he originally wanted to make a documentary about the man’s death, but the victim’s family refused to participate. He said that in Uganda, homosexuality is considered a choice and that he would not want to be queer if it were a choice that he could make. “I don’t think Canadians truly understand what it’s like to live in fear everyday. Fear for your life, fear for your friends, your lovers, your family,” Houston told students, faculty and others who attended the event organized by the Ryerson Journalism Research Centre. Ugandan President Yoweri Museveni signed a bill in 2014 that defined homosexual behaviour as a crime punishable by life in prison. Colloquially known as the “kill the gays bill,” the bill was the subject of international condemnation and was eventually annulled by the country’s Constitutional Court over a technicality. It nonetheless remains illegal to be gay in Uganda. Hassan said members of the LGBTQ community are often exiled by their families and friends, lose their homes and are fired from their jobs. The government, for instance, moved quickly to halt a recent Ugandan LGBTQ Pride event. Ethics and Integrity Minister Lokodo Simon released a statement that read, “The organizers of the planned Gay Parade on Saturday, Sept. 24, 2016 are advised to stop their activities immediately or otherwise they will be arrested and prosecuted in the courts of law.” He said that the event is against the Ugandan Penal Code, which states that promoting homosexuality is against the law. Hassan said he had to shoot Outed in secret because he was worried the police would realize they were making a queer film. And when it was released, he could only show the film in secret at queer-friendly venues because it was banned from being shown in public. Any film depicting homosexuality, he said, is considered an attempt at “recruiting” straight men and young people to become gay and is therefore considered a criminal act. While his film is still banned in his homeland, Hassan has received positive feedback from the international film community. He won the Barbara Gittings International Human Rights Award in 2015 and the Best International Feature Film Award at the Baltimore International Black Film Festival. Hassan and his business partner, Montreal media artist and curator Karin Hazé, who also attended the RJRC screening, are starting a mentorship program for filmmakers in the 75 countries that have criminalized homosexuality. The program, called 75 Shots, will provide a platform for LGBTQ directors in those countries who want to use their films to speak out against criminalization. Hazé said they hope to start the project this year. “The inspiration for this mentorship program is to let people tell their own stories in their own words … using film as a weapon,” said Hazé. Hassan is also raising funds to create the first – and now only – queer film festival in Africa. The Queer Kampala International Film Festival celebrates the diversity of Kampala’s queer community and aims to spread awareness through film, he said. Hassan said he has been arrested for his films and for his efforts to champion the film festival. Once he returns to Uganda, he said, he could go to jail for 14 years. He hopes that a Twitter photo of himself marching in this year’s Montreal Pride parade with Prime Minister Justin Trudeau will protect him. Ugandan authorities, he said, may “think that the world is looking at [him] in a certain way.” The photo could also put him in danger, however, if the authorities think that he is returning from Canada with money and foreign political connections to “recruit” straight people into “homosexual lifestyles,” a common conspiracy theory in the country. Regardless, Hassan says that social media plays an important role in the fight for human rights and even once saved his life. He and about 300 others were arrested for marching in this year’s Ugandan Pride Parade, he said, and held by police in a very small room. They were not allowed to leave, use the washroom or use their cellphones. Many were beaten, stripped of their clothes and sexually violated. They managed, however, to secretly Tweet what was happening and this sparked international outrage about their situation. Foreign embassies contacted the Ugandan government and managed to get Hassan and the other marchers released. Despite the dangers, Hassan said that he wants to tell such stories so he can “push and change things” in Uganda, rather than have to change himself and the LGBTQ community.